Daver Karnosky/Daily Mining Gazette Houghton’s Dawson McKay celebrates after scoring a goal during a game against Kingsford two seasons ago at the Dee Stadium. 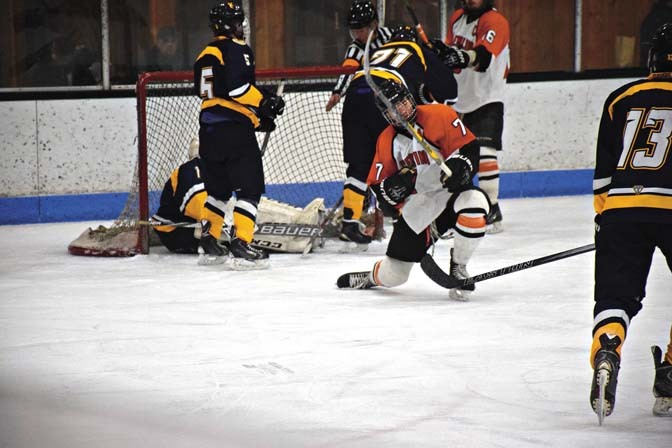 With the Copper Island Classic last weekend, the high school hockey season has begun. As a former Houghton Gremlins forward, these are the days I live for each season. I played two seasons for the Gremlins during my four years in the school, and I would not trade the experiences I have for anything. Keep in mind, I was not Dawson McKay. I was not Brent Loukus. I was not Raymond Brice or Alex Nordstrom, or even Tanner Rowe. I was just a third-line center who shared the position with a teammate during my junior year and had it to myself as a senior. I grew up hearing stories about the late, great Don “Mitt” Miller. I was told about how he would get so mad at his team, when they played poorly on the road, that he would force them to leave an arena still half-dressed, ride the bus back to Dee Stadium, and then he would hold “practice” there, ala that great scene in the Disney movie, Miracle, where Coach Brooks skated his team after a tie with Norway, if my memory serves. The guys would skate until the puked, or worse. When I was a freshman, I was a first-year Bantam. I had already heard several stories about Mitt and knew that I was not ready to take the next step and even try out for the Gremlins. Of course, I also feared for my life. I spent the bulk of that season playing defense. Injuries had ravaged our team early in the season, and our head coach, Leo Durocher, had put one of our other forwards back on the blue line. That young man did not fit well in the position, so I talked it over with my parents. I did not come to a decision very easily. As an eighth grader, I was a second-year Pee Wee. I had a great year offensively that year, starting the season with a hat trick in my first game and enjoying modest success on the penalty kill and with various linemates throughout the season, including Dan Juopperi, who is a linesman now for Michigan Tech games and an assistant coach with the Hancock Bulldogs. After coming to an understanding with my parents, I approached Leo before practice one night and asked him if he would consider swapping my teammate and I. I learned a lot that season playing defense. I learned about proper positioning, how to pinch a forward off, how to direct a forward where I wanted him to go, rather than where he wanted to go, and I learned a lot about myself. As a sophomore, I was lucky enough to be able to eligible to play a second year of Bantams. As I have mentioned before, I was the top center on our Bantam A team, which would translate to 14U Tier II, I think, now. We had a really young team, but I had a chance to be a co-captain for the full season. I learned a lot about leadership that season, mainly because our team needed players to step up. Even though the teams we played that season were not as strong as the ones we played the year before, I had a chance to blossom. As a junior, I was ready for the next challenge: high school varsity hockey. After a fun, difficult week of tryouts, I was picked as one of 10 forwards. The Gremlins were fresh off a state runner-up performance the year before. I found myself sharing, both in drills and in games, with another center. That was probably the hardest thing about playing high school hockey. I felt, throughout that season, that I had so much more to give, so many more ways I could help the team, if I was just out on the ice. I scored three goals that season. Looking back on things, considering we had three lines and I played half of the time that my line was on the ice, I guess I should be proud I accomplished that much. I wanted to show I could give more. It did not help that late in the season, I took a particularly nasty hit in what is now known as the Calumet Colosseum. One of my teammates threw me a pass that was bouncing as it got to me. I tried to corral it, looking down at the puck, and then I woke up seeing a world of gray. I was face first on the ice after the hit. I spent the spring recovering from that hit and the concussion I received. I also decided to look elsewhere to play, given that I wanted to see the ice more. I settled on a Midget AAA team out of Green Bay. I played in 20 games for the Roadrunners before deciding that I wanted to give high school one more try. I joined the Gremlins just in time for what was called the “Scramble.” I was inserted as the third line center on a team that took 10 forwards out of tryouts before I joined to give us 11. My senior year, I scored three goals and 11 points, again nothing like what the Loukus’ or the McKays or the Nordstroms and Randells have scored, but that was not my role. We went on a 17-game unbeaten streak after the MacInnes Holiday Classic and made it to the state semifinals before losing to Bloomfield Hills-Cranbrook-Kingswood in overtime. While not easy, I absolutely have nothing but fond memories over the two years I played for Houghton. I can only hope that this year’s seniors, whether Gremlins, Bulldogs, Copper Kings or Jets, experience the types of memories I have and build something they can enjoy the rest of their lives.